Learn how MBA students at EIU compete in the top tiers of the Capstone management simulation. within 3 months of graduation. The MBA Program at Eastern Illinois University is one of 11 Illinois universities accredited in Business and Accounting by the Association to Advance Collegiate Schools of Business (AACSB). MBA Graduates continue or enter their professions in accounting, finance, operations management, consulting, human resource management, marketing, sales, and information technology. Our alumni are often promoted into executive-level positions, or are hired into analyst or supervisory positions, upon graduation. Our 2018 School of Business placement data (with a 60% response rate) indicated that 100% Applied Management and Research Option and 92% Business Administration MBA alumni were employed in career-related positions within 3 months of graduation. According to Dr. Michael Dobbs, Associate Professor of Management and Graduate Faculty in our MBA program, "The very first MBA program was established at Harvard in 1908 as a professional degree program similar to schools of law or medicine. 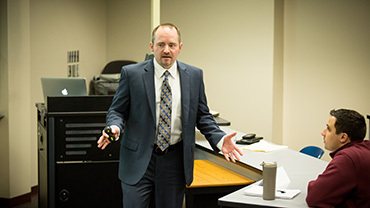 The faculty provided instruction in various business disciplines, but the primary goal was to train students to think in a broad, comprehensive way. 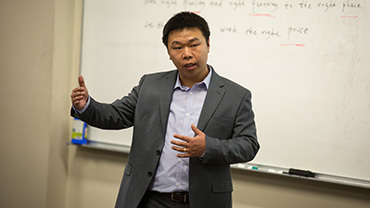 The EIU MBA program embraces that purpose and legacy by having a unique structure: courses in the various business disciplines (e.g., finance, marketing, accounting, etc.) are book-ended by two courses designed to encourage and develop a broad, comprehensive way of thinking. The MBA 5000 Strategic Management course is designed to be taken in the student's first semester and serves as an introduction to all the various disciplines. In the student's final semester, MBA 5900 Management Simulation provides students with opportunities to bring the full range of their newfound knowledge and training to bear on a series of simulated business challenges. Most MBA programs in the US have a course like one of these, but only a few have both courses. This structure makes the EIU MBA program not only different than most, but true to the legacy of training managers to think in broad, comprehensive ways so important to the early developers of the MBA program at Harvard1." Want to learn more? Whether you are already a business professional or whether you are thinking about becoming one, this website offers helpful information about EIU’s MBA program and what we have to offer. Classes are offered in Charleston at EIU's Main campus and also at Parkland Community College in Champaign, IL. Students can attend classes at either location towards their MBA degree. Each student is provided with an individualized course plan that outlines semester-by-semester the courses that they can complete to graduate by their preferred graduate date. This could be one, two, three, or even four classes per semester. We offer two types of capstone experience: a traditional academic thesis and a creative thesis. A traditional thesis provides students an opportunity to engage in original research that can make an important contribution to the field. Students may also complete a creative thesis, which can be thought of as an advanced applied project in the student's area of interest. This allows our students who are professionally oriented to design and engage in a capstone project that can add substantial applied work to their graduate experience. With an impressive list of successful graduates and many other business contacts at its disposal, the MBA program at EIU put students in contact with accomplished professionals who can pass along information and knowledge that will help them succeed in the work force. At EIU, we take pride in making a quality education affordable, and the MBA program is no exception. In addition to our competitive tuition rates, students have the chance to compete for a number of program-specific scholarships as well as numerous other financial aid opportunities. The Accountancy Concentration is intended for students who have completed an undergraduate degree in accounting, and the program will prepare students to meet the educational requirements necessary to take the Certified Public Accountant examination. Click here for more information on this program. The Applied Management Option is focused on “hands-on” development of students’ intellectual and creative capacities. The program addresses a broad range of business-related skills emphasizing a combination of teamwork, writing, contemporary global and ethical issues, and analytical skills that can be immediately put into practice. Click here for more information on this program. The Research Option is designed for students who want to focus on business research and quantitative methods for research. Students would want to complete the Research Option if their goals are to continue their education and pursue a Ph.D., or if they have an interest in conducting research with a faculty mentor. Click here for more information on this program. The GIS Option is designed to support careers using computer systems to capture, store, manipulate, analyze, manage and present spatial or geographical data in a variety of fields including management, logistics, insurance, and telecommunications. Click here for more information on this program. The MBA Online at Eastern Illinois University is designed so that students complete their program of study in two calendar years over six consecutive semesters. Two classes are offered each term. The tentative schedule of course offerings, with two sample entry points and different degree completion plans is provided at our site related to Courses. Click here for more information on this program. "I consider the EIU MBA program one of the most realistic experiences I have ever had. A professional teaching staff with appropriate backgrounds, friendly environment, and constant pursuit for academic excellence are the key elements of such a valuable experience." "The MBA program at Eastern Illinois University provided me ith the practical application of theory, changed my business outlook and structured my thinking process. It helped me to develop the right managerial tools to identify problems, analyze situations and formulate appropriate strategies for problem solving." "The EIU MBA program has provided the advanced skill set to enhance my business, leadership and management skills and has given me the confidence to take on challenges in my career. The flexibility and convenience of a part-time program offers the ability to take classes at an off campus location without diluting the content of a traditional MBA." "In my career, I have not yet faced a situation that I was not prepared for because of my experience at Eastern. Whether it was from a lecture series, project team, or one-on-one time with faculty, my development in the program exceeded my expectations and has provided me with much confidence in taking an active role in developing global strategies and implementing innovative ideas." Mr. Nathan B. Englehardt: Pricing Consultant, Global Revenue Management, Caterpillar, Inc.